With bated breath, the entire boxing world is looking forward to the eagerly anticipated rematch between Carl Froch and George Groves. The sheer energy and excitement that will undoubtedly be unleashed by 80,000 screaming British fans is so electric it can practically be felt already. Their first encounter was incredible, and there is every reason to believe that this time the action will be every bit as intense, with the possibility of even exceeding the former’s fireworks. The atmosphere being generated is so fiery and profound and explosive, that it is totally reminiscent of the mood often created during the lead-up for fights involving the soon-to-be Hall of Fame inductee, Joe Calzaghe, the greatest super middleweight boxing has ever known. Makes you kind of wonder how Joe Calzaghe would do if he was fighting today at or near his best? Looking at some of the top names currently floating around in the super middleweight and light heavyweight divisions, one might quickly notice that Calzaghe had actually faced and defeated several of the best fighters those weight classes have to offer. Joe already outclassed Sakio Bika back at a time when Bika was one of the most avoided men in boxing. He also put on a masterful showing against Mikkel Kessler when the Danish fighter was still healthy and at the peak of his prime. Most impressive of all, however, was when Calzaghe took Bernard Hopkins to school, beating him at his own game in his own backyard. And this happened way back when Hopkins was a young 43 and on top of his game, not the grizzled 49 year old veteran who is still a dominant force today, marking this victory a testament to Calzaghe’s greatness. Joe already beat better versions of these 3, and this all happened when Calzaghe was older and visibly faded. It’s safe to say a prime or near-prime Joe would probably have an easier time facing and defeating older versions of these boxers he already beat, back when he himself was past his best. Without meaning to sound disrespectful to the following fighters, there are a crop of top names that Calzaghe would have almost certainly beaten, and those include Arthur Abraham, Robert Steiglitz, Jean Pascal, Lucian Bute, Anthony Dirrell, Edwin Rodriguez, Thomas Oosthuizen, Tavoris Cloud, Nathan Cleverly, Andrzej Fonfara, Beibut Shumenov, Isaac Chilemba, and Chad Dawson. These guys are definitely very good boxers, and that’s clear from the fact they are all ranked contenders (or champions) who are held in high regard by the boxing public. But all of these boxers have exhibited weaknesses in the past, and Joe was utterly masterful when it came to exploiting even the slightest weakness unveiled in an opponent. None of these fighters are gifted with the type of speed and intelligence Calzaghe possessed, and none of them bring anything new to the table that Calzaghe hasn’t already seen and conquered before. It might be true that styles make fights, but Joe, like Floyd Mayweather, has seen and overcome every style he’s faced, and there’s nothing extraordinary about any of these fighters that would be likely to throw Joe off his game. If Bernard Hopkins couldn’t do it, back when Hopkins still had his A-game, it is doubtful any of these guys could. When comparing Joe to the participants of this weekend’s highly anticipated rematch, there are some very interesting match-ups to consider. Groves might actually trouble Joe more in the early going than we are accustomed to seeing, although not in the way he was dominating Froch last time around. But he has the athleticism and tactical abilities to keep it close, at least early, because as we saw in the Froch fight, Groves cannot keep the pace. Before the questionable stoppage, Groves had slowed down considerably and began eating shots from an already exhausted Cobra. 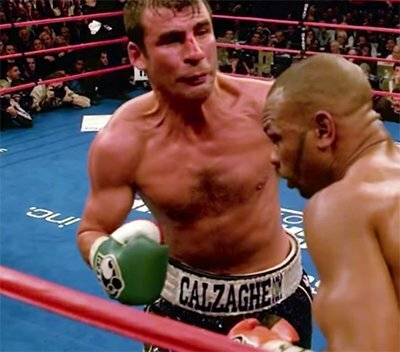 If Calzaghe is known for anything, it’s for his truly amazing ability to fight at the same pace an entire fight, where he wears out and overwhelms opponents with his almost inhuman stamina and activity rate. That spells doom for Groves, there would be no question about it. As for Froch, he has underrated skills and more to the point, he has underrated ring intelligence. But his best asset is his fighting spirit, his incredible toughness, and his unrelenting will and determination. That would be, and often is, the key for a Froch victory in any of his fights against elite opposition. Unfortunately for Froch, Calzaghe possesses the same unique gift, and in even greater abundance. On top of that, Joe is quicker, more intelligent, can take a better punch, has better footwork, better stamina, greater skills, more variety, better… basically more and better of everything with the possible exception of power (but Joe at or near his prime had far more power than many remember, so even that is debatable). Joe has Carl beat in every possible facet, including that which has always been most important for Froch when the going gets tough. Hard to see anyway for Carl to win against Joe. Taking a look now at two of the reigning light heavyweight champions, Adonis Stevenson and Sergey Kovalev, this again brings forth some interesting fights for Joe, but perhaps not as interesting as those mentioned above with Froch and Groves. The reason for this is, to a very large extent, Stevenson and Kovalev are overrated flavors of the month who are unproven, especially Kovalev. Yes, they can punch like wrecking balls, they are big strong guys, and they are decently quick. But they also both have questionable chins and have shown several other vulnerabilities that Calzaghe would surely capitalize on. Stevenson especially showed vulnerabilities in his recent bout with Fonfara, and worse yet, he showed stamina issues and doesn’t always seem focused and mentally strong. These shortcomings would spell doom against a master tactician like Calzaghe. Kovalev is trickier to judge, because he has looked extremely good of late, but to date his best win is still only against Nathan Cleverly. He has never faced an elite fighter, and he has never been taken into deep waters before. It is fair to maybe give these two, Kovalev and Stevenson, a puncher’s chance against Joe, but that’s about it. Calzaghe was far more skilled than these two, and would almost surely have no issues adapting to their styles and methodically breaking them down until he was having his way. Calzaghe may even stop them both, perhaps early, it’s a distinct possibility. Finally there’s Andre Ward. He’s the best at 168 right now, but imagining a prime Calzaghe being around today, it’s honestly hard to believe that a fight between him and Ward would ever even happen. Aside from being MIA and ridiculously inactive since his good run in the Super 6, Ward is one who likes to have things his way, and Calzaghe isn’t the type of guy I can imagine being bullied around in negotiations, where he’s forced to fight in Ward’s home realm of Oakland, where Ward tends to get away with an awful lot of rule-bending, especially when it comes to “accidental” headbutts and excessive holding among other questionably legal tactics he employs. Not many boxers want to face Ward in his comfort zone in Oakland, and there’s a good reason for that if you see some of the things he gets away with there. He also has shown a willingness to do whatever it takes to get an advantage, like when he refused to face Chad Dawson at 175, or even at a reasonable catch weight. Ward likes having things his way, and since he isn’t an especially big draw this could be troublesome for the potential of the fight happening. Ward may even show reluctance to face Calzaghe in the same way he was peculiarly reluctant to face Lucian Bute at a time that fight made all the sense in the world. But if the fight did happen, and the current version of Ward faced a prime or near-prime Calzaghe, there’s a good chance Ward would be Joe’s greatest test if Andre was able to take Calzaghe’s punches. Andre is a clever fighter who has good movement and nice variety, and he’s pretty smart inside the ring with the rare ability to adapt. If this became a boxing match and Ward was allowed to employ his bag of tricks bordering on the illegal, he could make things a little rough for Joe in a dirty fight. But Ward lacks the activity rate and creativity that Calzaghe brings to the table, and he takes rounds off sometimes whereas Joe fights hard every second of every round. As good as Ward is at adapting, as dirty as he can be, and as smart as he is, it’s another case of Joe being better, whether it’s Joe being better at adapting, Joe being able to fight dirty to combat dirty tactics (like he did with Hopkins), or whether it’s simply Calzaghe having a higher ring IQ than Ward. Calzaghe does everything better, and Joe’s advantages in speed, stamina, and output should be enough for him to earn a comfortable points victory over Ward. Calzaghe is a boxer that often gets overlooked and underrated, and it’s a shame because he was one of the most exceptional talents to grace the ring in this generation, or any generation, during his illustrious Hall of Fame career. He remains the greatest super middleweight of all time, and may well remain so for all time. It’s perfectly logical to conclude that if a prime or near-prime Joe Calzaghe was fighting today, that he would be just as successful in this era as he was during his own. Hopefully he will get more of the recognition he deserves after he is officially inducted into the IBHOF, and hopefully the Froch-Groves rematch lives up to expectations. Previous boxing news: Comanche Boy Back in Action Next Friday, June 6! You are here: Home / Boxing History / How would a near-prime Joe Calzaghe fare today?